Handyman Dem eyes fixer-upper on Pennsylvania Ave. If Democratic Sen. Jeff Merkley decides to run for president, he'll be trumpeting the threat of climate change — and his prowess with a hammer. The progressive junior senator from Oregon, who some consider a dark horse in a race for the 2020 Democratic presidential nomination, said he's getting a lot of encouragement for a possible White House run as he plays up his working-class roots. "I've spent some time in some of the early primary states to see if my blue-collar roots and blue-collar life, common sense, resonate, and if the battles that I've led resonate," he said in an interview this week. "I haven't ruled it out yet," he said. Called a "quiet stalwart of the left" by The New York Times, Merkley, 61, has been talking a lot about protecting the environment and thwarting climate change. He's introduced legislation to transition the nation to 100 percent renewables, extend tax credits for clean cars and keep fossil fuels in the ground. In addition to making trips recently to early presidential primary and caucus states, Merkley has been an outspoken critic of top Trump administration officials. He was, for example, the first senator to call for acting EPA Administrator Andrew Wheeler to step down after news broke that he had interacted with racist material online. Wheeler has since tried to distance himself from that activity. 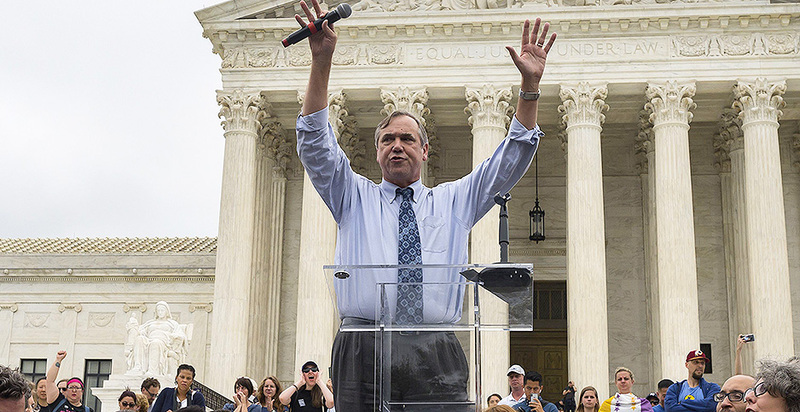 Merkley also recently sued to halt the confirmation of Supreme Court Justice Brett Kavanaugh and, in June, had what the Times called a "breakout moment" when he livestreamed his trip to the South Texas border, where he was denied access to an immigrant detention center. The son of a millwright and homemaker, Merkley was born in Myrtle Creek, Ore. — population 3,439 — but spent most of his childhood in Portland. He says he grew up "making things" and has continued to nurture a passion for home improvement, regularly posting pictures of his home renovation projects on Twitter. His interest in politics was piqued while earning an undergraduate degree at Stanford University in international relations and, later, a master's degree from Princeton's Woodrow Wilson School of Public and International Affairs. In the early 1980s, Merkley took a year off from studying to live in Washington, D.C., interning for then-Oregon Republican Sen. Mark Hatfield's office. He later worked as a national security analyst for the Pentagon and the Congressional Budget Office. Merkley would return to Oregon in 1991 to lead Portland's Habitat for Humanity and later served as the president of the World Affairs Council in Portland before he was elected to the Oregon House of Representatives as a Democrat in 1998. He then rose to speaker of the House in 2007. The following year, he announced his planned run for the Senate — and was elected to the upper chamber in 2008. You called for Wheeler to resign and he hasn't. What's your reaction? I'm not surprised, because there are no standards too low for this administration to consider continuation of public service appropriate. But I do think we — the public, those of us outside the administration — need to keep saying there are standards for public service. If you're engaged in essentially inappropriate conduct, particularly in this case promoting racist photos, among a whole list of other right-wing actions, you shouldn't be serving as head of the EPA. Why do you think you were the only senator to call for him to step down? I think that there's fatigue that is setting in because of so many members of this Trump team that have had such low standards. I mean, so many of us called for Scott Pruitt to step down for so long before it ever happened, and he had to run up — what did he have, how many — two dozen, more than two dozen investigations or something like that going at one time? When will you decide on a White House run? Well, I'll wrestle with the details after this fall's elections, and I've spent — most of my focus has been on 2018 and the Senate races that could make a big difference in how the Senate is operated and in how nominations go through the Senate. What role would climate change play in your platform? Very prominent. It is, on the one hand, an enormously destructive force that you see if you open your eyes or your ears at any moment. It is the biggest challenge humanity has faced. The clock is running out before the feedback loops start to take over. And so we need intense action. We need to view it as a major calamity that's unfolding right now, and we have to act fast in the U.S. and have to act fast to lead the world. What do you make of Trump's recent comments on climate change? The president has apparently no ability to absorb facts or information, and his wishing for a problem to fix itself does not make it so. As long as carbon dioxide levels are continuing upward, and they're going up now much faster than they were 20, 30 years ago ... there's no reason to think it's going to be different now. Is there a growing concern about climate change in the Republican Party? There are some senators from states that have been affected by the fires and the floods who are starting to feel very concerned that they're not engaged in the conversation about climate. But they are very reluctant to say anything publicly because of the powers of the Koch brothers in pulling the strings of the Republican caucus. You've been called a "quiet stalwart" of the Democratic Party. Are you quiet? [Laughs.] I don't know how I can possibly be quiet when I'm proceeding to lay out ideas and advocate for them in every way possible, in every form possible. No, I don't see myself that way. What was it like growing up in Myrtle Creek? My father was a mechanic. ... When I was born, he was the millwright in a small sawmill in, just south of Myrtle Creek. A lot of these little towns were centered around sawmills, but he was at a mill in Riddle, which is just down the road from Myrtle Creek. We were only there until I was 2 or 3 because an investor bought the company and shut down the mill overnight. So we moved to Roseburg, which is a larger town in southern Oregon, still very much focused on the timber world. And when the economy got tough there, we moved up to the outskirts of Portland. My dad just continued to work as a mechanic, primarily on large machinery that is used on highways and in forests. I've heard you're thrifty. Do you ride the Metro? [Laughs.] So I did take the Metro for several years while my family was in Washington, but when they moved back to Oregon and when I was leaving at 6 a.m. and coming back at midnight, I started driving. When I was in my bachelor years ... I drank powdered milk rather than buying fresh milk and lived on rice and frozen peas and macaroni and hot dogs. It was not the healthiest in the world, but it was certainly inexpensive — lots of sandwiches for dinner. Your Twitter feed is full of home improvement pictures. Why? I do love building, and having grown up making things in — the neighborhood I lived in, a blue-collar community — well, the same community I'm in, that I was in from third grade through graduating from high school. And then when my wife, Mary, and I were — when our son was born, we moved back to that same neighborhood. When I left the federal government I gutted a townhouse and rebuilt it, and just continued to do those projects. And every now and then, I am actually successful. I recently took on the challenge of the broken counter springs above a garage door. The wildest thing I did in the last few years was get up on top of the roof with a sledgehammer and start taking out the brick chimney. And I took it all the way down to the floor of the first floor, and so you start disappearing through the roof as you start knocking bricks out on your way down. It was quite a scene. The neighborhood got quite a kick out of it. The neighbors started coming over, knocking. "Can we see what Jeff's doing? It sounds crazy."